While vane pumps can handle moderate viscosity liquids, they excel at handling low viscosity liquids such as LP gas (propane), ammonia, solvents, alcohol, fuel oils, gasoline, and refrigerants. Vane pumps have no internal metal-to-metal contact and self-compensate for wear, enabling them to maintain peak performance on these non-lubricating liquids. Though efficiency drops quickly, they can be used up to 500 cPs / 2,300 SSU. Vane pumps are available in a number of vane configurations including sliding vane (left), flexible vane, swinging vane, rolling vane, and external vane. Vane pumps are noted for their dry priming, ease of maintenance, and good suction characteristics over the life of the pump. Moreover, vanes can usually handle fluid temperatures from -32°C / -25°F to 260°C / 500°F and differential pressures to 15 BAR / 200 PSI (higher for hydraulic vane pumps). 3. As the rotor continues around, the vanes sweep the fluid to the opposite side of the crescent where it is squeezed through discharge holes of the cam as the vane approaches the point of the crescent (small red arrow on the side of the pump). Fluid then exits the discharge port. Externals (head, casing) - Cast iron, ductile iron, steel, and stainless steel. Vane, Pushrods - Carbon graphite, PEEK®. 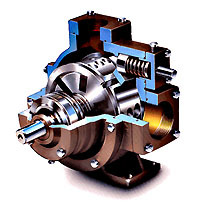 Shaft Seal - Component mechanical seals, industry-standard cartridge mechanical seals, and magnetically-driven pumps.